Minister of Foreign Affairs and International Business, Hon Nickolas Steele, joined over 600 high level delegates in the United Arab Emirates on Sunday 4 May, to lend their voices and their allegiance to confronting the challenges of climate change, at The Abu Dhabi Ascent in support of Climate Summit 2014. The Ascent has as its focus the call for world governments to exercise political will, and for the formation of partnerships to address climate problems, ahead of the United Nations September 2014 Climate Change Summit in New York. Headlining Sunday’s opening session was former United States Vice President, Hon Al Gore, who is renowned for his tireless climate change advocacy work. Mr Gore admonished governments and citizens that it is morally unacceptable to not act to reverse the effects of climate change and the ensuing destruction to our atmosphere. He noted that subsequent generations will blame today’s people for not having the will to protect their future. Another forceful presenter was former Prime Minister of Great Britain and Northern Ireland, Right Hon Tony Blair. He stated that the more developed countries have a responsibility to help the less developed countries to enact practical and sustainable policies that protect the environment, as well as livelihoods. United Nations Secretary-General Ban Ki Moon, as well as President of the UN General Assembly, John Ashe, lent their voices to the urgent call for collective world action to address the challenges of climate change and reverse the effects. The Abu Dhabi Ascent in support of Climate Summit 2014 is an initiative of Sheikh Abdullah bin Zayed Al Nahyan, Minister of Foreign Affairs of the UAE, who sees the UAE as a small space but one that is absolutely critical and central in playing a huge role in bringing about climate change. 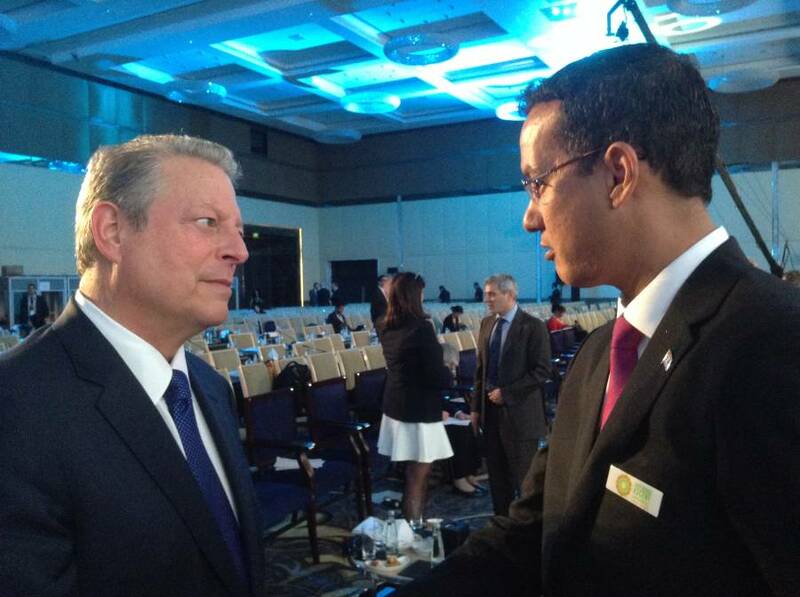 Minister Steele briefly engaged Al Gore on the opening day, impressing upon him that Grenada has the political will that has been the resounding call by the presenters. The challenge for Grenada is to now garner the resources necessary to bring about that change, particularly in the quest for renewable energy, and any assistance in achieving this would be welcome. The Abu Dhabi Ascent is due to continue today, when Minister Steele will address his Small Island Developing States (SIDS) counterparts on prospects for renewables.